Raptors are large, carnivorous birds with common characteristics such as sharp vision, lethal talons and curved beaks. Diurnal raptors, meaning they take flight during the day, include hawks, falcons, eagles and harriers. The list of nocturnal raptors is composed mainly of owls. Coastal raptors live primarily along seashores and estuaries, but may travel over great distances in search of prey. Peregrine falcons are famous for their impressive diving speeds while hunting, reaching more than 200 miles per hour. These falcons live on every continent except Antarctica, preying upon everything from small songbirds to large water fowl. Northern peregrine falcons are migratory, traveling more than 20,000 miles per year. Those living closer to the Equator, with more reliable food sources year-round, tend to stay put. The peregrine falcon was popular with ancient royalty and appears on the Idaho state quarter. In the wild, the red-tailed hawk can live more than 20 years. One of the most widely found raptors in North America, the red-tailed hawk will live in nearly any type of habitat, including coasts. This hawk avoids densely forested areas, preferring open areas instead. The red-tailed hawk is a vocal raptor, calling out frequently with a high-pitched scream. The largest terrestrial bird in North America, the California condor soars above the California coastline between Big Sur and Ventura. Traveling more than 150 miles per day in search of carrion on which to feed and soaring to heights of up to 15,000 feet, there are wild populations of California condors in Arizona, Utah and Baja California. Making a comeback from the brink of extinction, no California condors existed in the wild between 1988 and 1991. A successful captive breeding program has allowed these birds to be reintroduced into the wild, and as of March 2007, 130 wild California condors inhabited the southwestern United States. An Arctic-dwelling species found primarily along the coastlines of Canada, the gyrfalcon rarely reaches the northern United States. The gyrfalcon is the world's largest true falcon, using his impressive power to overcome his prey, at times running the prey down and wearing it out. With a lifespan of roughly 13 years in the wild, the gyrfalcon is a solitary bird except when breeding. Revered by falconers, during the Middle Ages only kings were allowed to hunt with gryfalcons. The osprey inhabits any aquatic habitat including coastal areas on every continent except Antarctica, feeding solely on live fish. 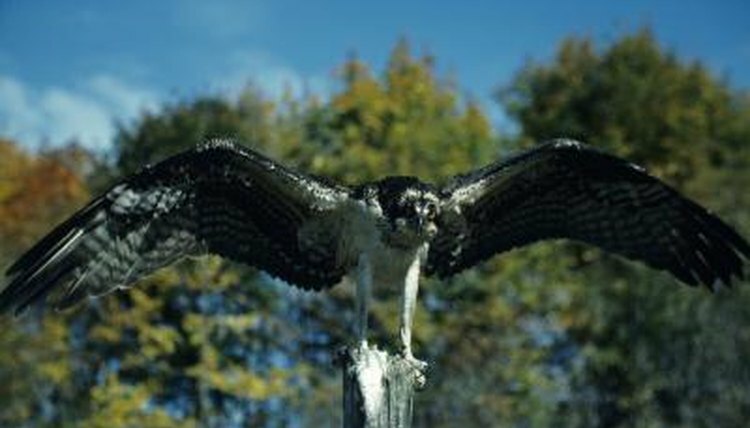 Once he captures a fish, the osprey flies with the fish parallel to his body, making his prey appear more like a torpedo ready for launch than his lunch. This powerful raptor inhabits forests along the coasts of Oregon, Washington, Alaska, New England, Canada, Eurasia and Siberia. He is known to doggedly pursue his prey for up to an hour and even chase prey into buildings. Aggressive by nature, the northern goshawk will attack any human or animal who ventures too close to his nest. Perhaps in deference to his fierce nature, Atila the Hun wore a northern goshawk on his helmet. The Steller's sea eagle is the largest of this group, living along coastlines in northeast China and Russia and parts of Japan. The bald eagle is the most recognizable sea eagle in North America. The white-tailed sea eagle soars over Eurasia, and the white-bellied sea eagle inhabits southeast Asia and Australia. This group of sea eagles is rounded out by the Madagascar fish eagle.